View of the lake from our room. Sitting area, which was later used for dinner. A large space near the doorway. 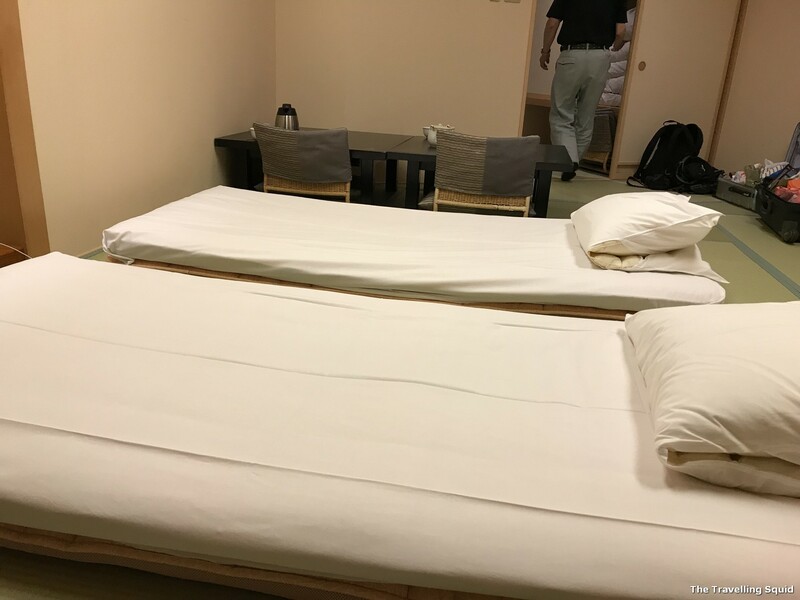 The room was really spacious for two. There was a large doorway for you to sit and put on your shoes. 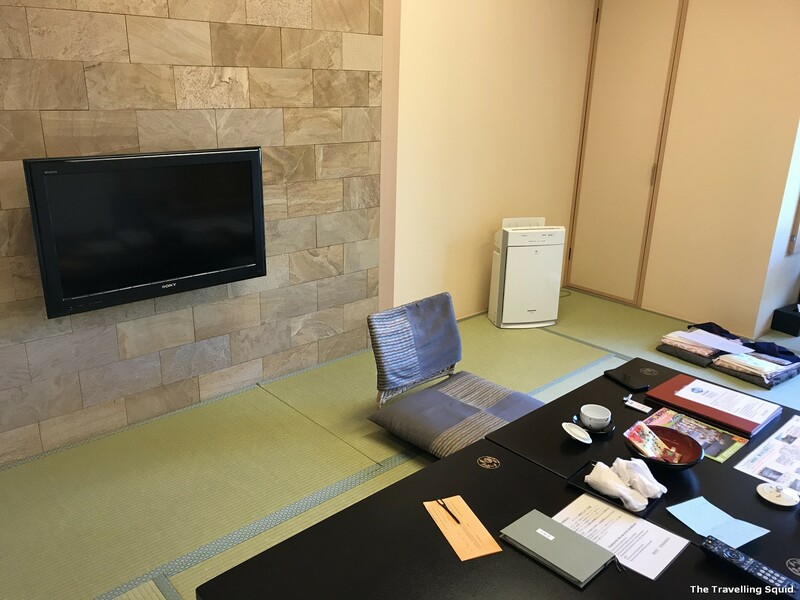 (A luxury we did not have at our guesthouse in Kyoto (ha! 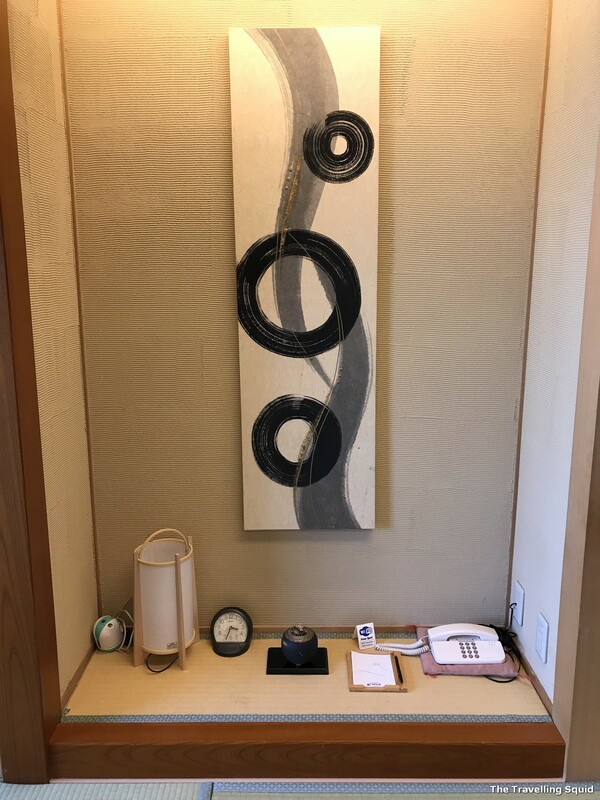 more to come in the series of posts on Kyoto). Sitting area – these seats were low, but more comfortable than the bamboo chairs which were used while we were eating. 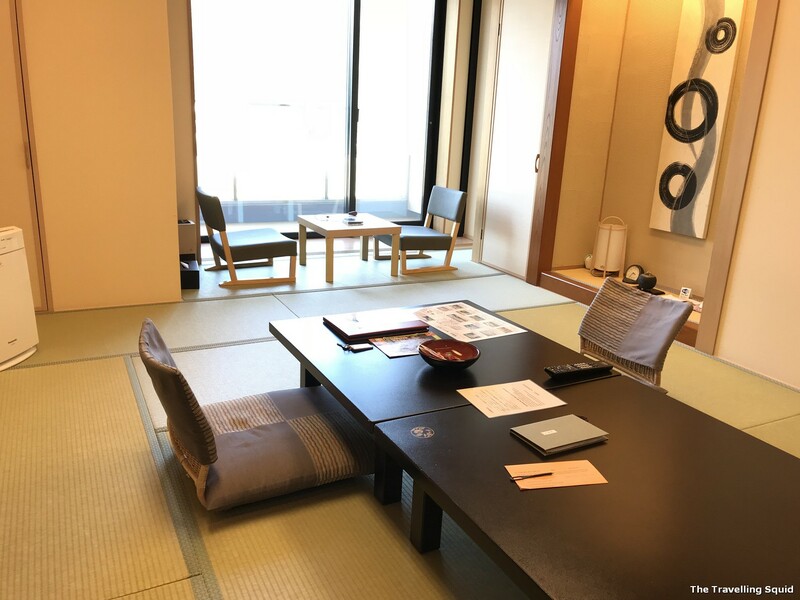 The room was covered with tatami mats, which acts as an insulator against the cold, especially during winter. There were no sofas or beds, only low chairs, two low tables and a television which was mounted at a sitting height. If you’re wondering what is that ‘back-scratcher’ on the right in the picture below, it’s actually used to press one’s pressure points for better blood circulation. The curvy tool on the right hand side was interesting. Like the Chinese back-scratcher, it’s meant to help you press certain acupuncture points to help with blood circulation. Decorative piece at the side of the room. It came with an alarm clock. That’s the TV which hung really low. The issue with sitting cross-legged on the floor was that the chair was too light. When I sat too close to the edge of the chair near the back rest, it tilted and I nearly felt over! It’s also a bit tiring on the knees, having to get up and down each time I stood up. 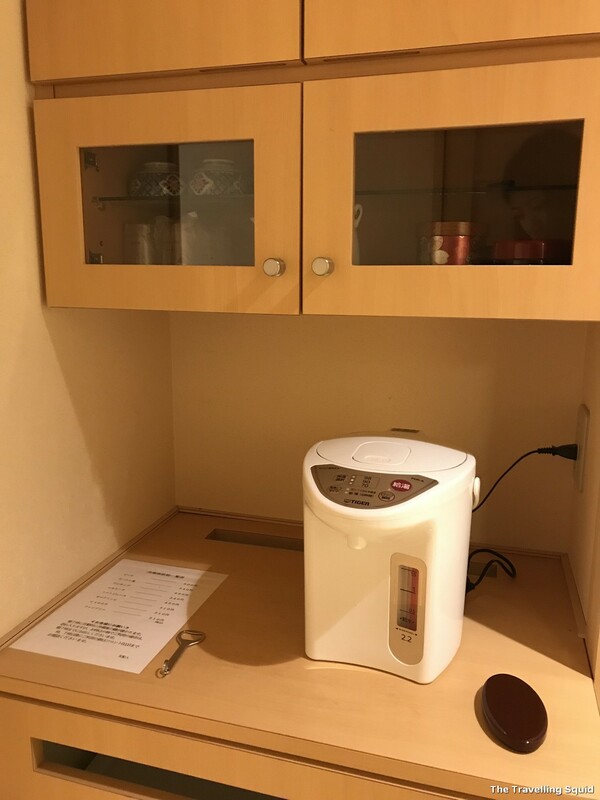 There’s an area for you to make tea with – perfect for a tea-lover like me. 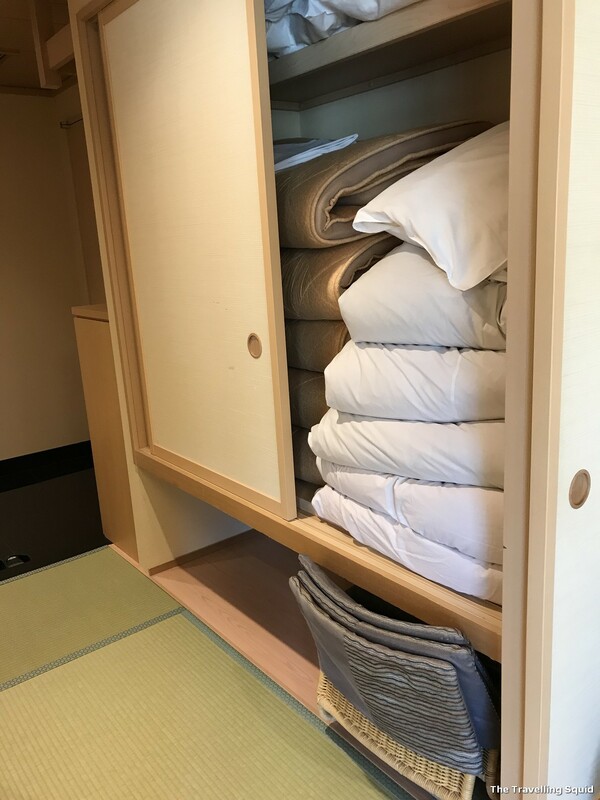 Pillows and blankets in the cupboard. Setting up the beds at night – it’s hard work. The staff was panting by the time he was done. The comforters were warm and cozy. If you’re thinking that sleeping on a futon is less comfortable than sleeping on a mattress, it’s not quite the case. The feeling is different, but I fell asleep right away. The pillows are most interesting. They come with beads sewed into the case, so that gives you the option of adjusting the height of your pillow. 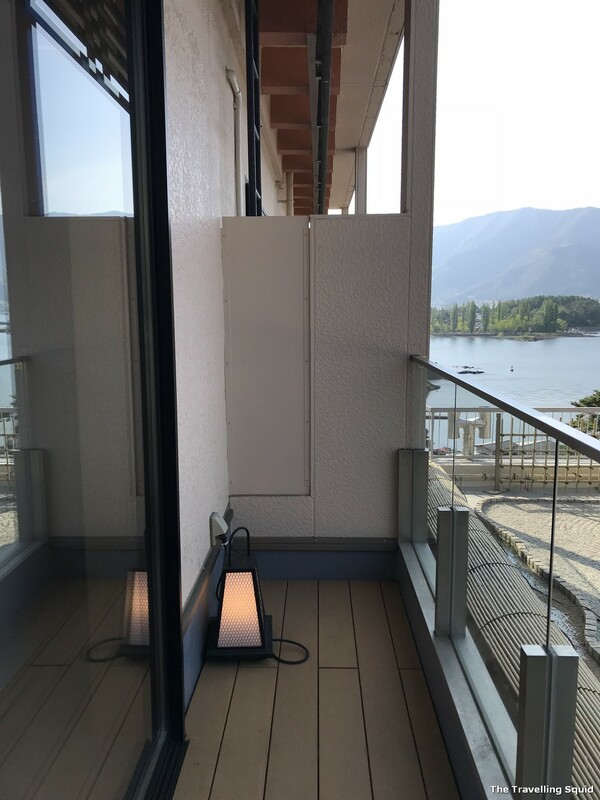 The room came with a balcony which looked out into the lake and landscaped garden in front of us. It was quite a nice touch. It was nice to hang out by the balcony and watch the sunset. The landscaping outside is quite pretty too. The bath room comes with a stool. Love the wooden furnishings. 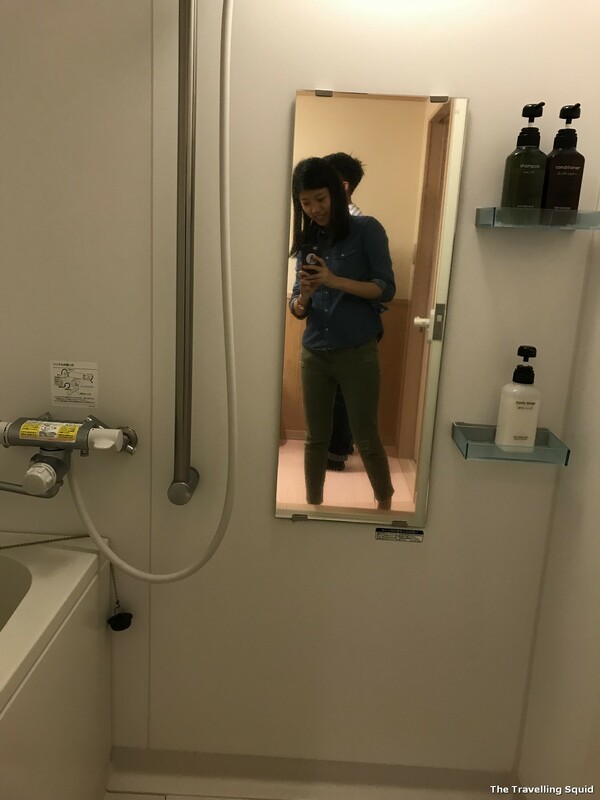 The bathroom and toilets were in separate rooms. I must say it’s probably the best bathroom ever, given that there’s a stool for one to sit down and dry one’s hair. I suppose you could also sit on it and brush your teeth. 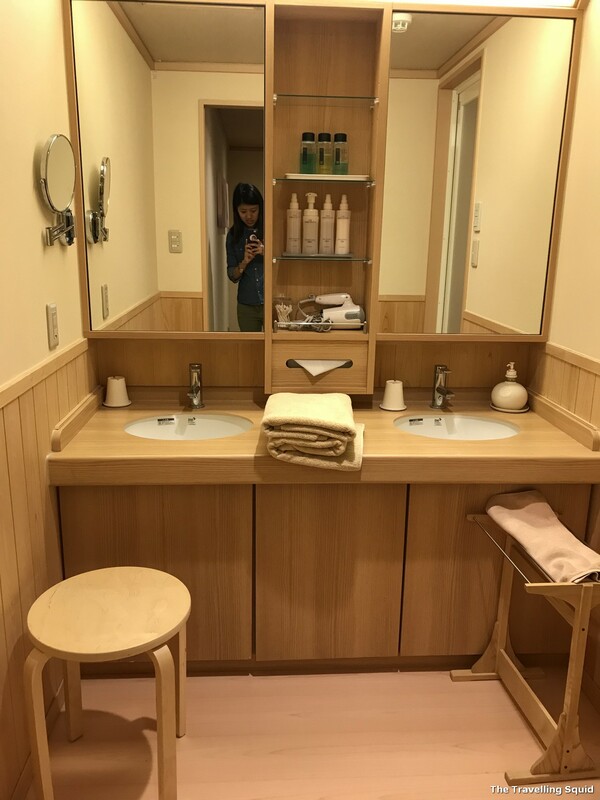 I was suffering from sunburn after queuing for a bowl of delicious ramen in Ginza, and the Shiseido skincare products did help very much! 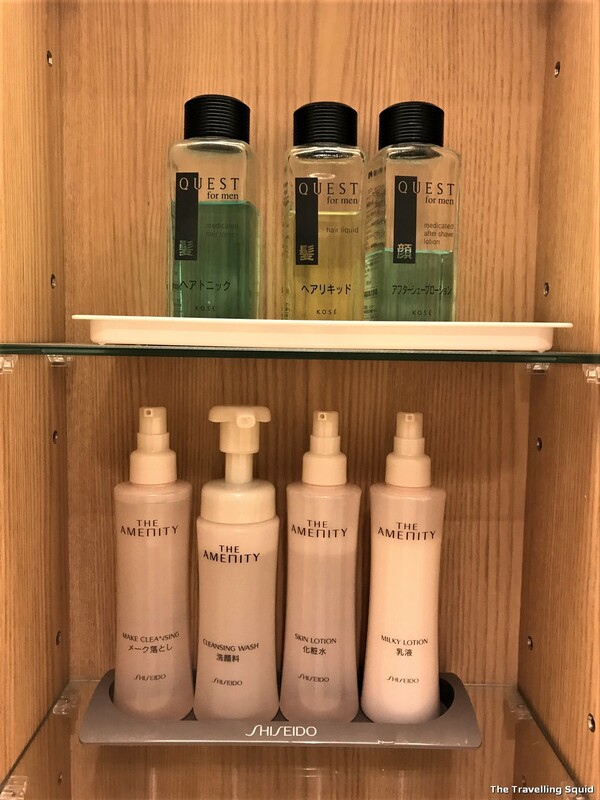 Shiseido skincare products lined the shelves, for women and men. Bathroom – simple and functional. 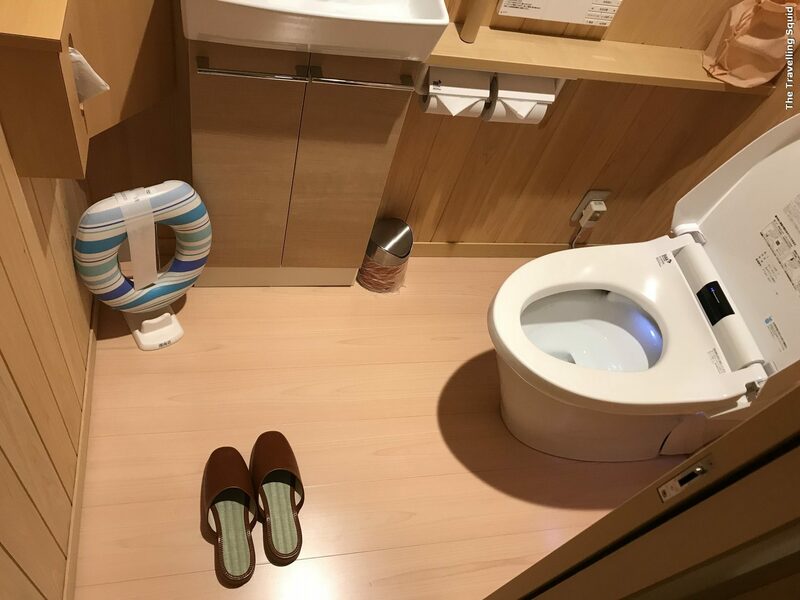 The toilet was probably the best we had used. The seat cover lifted on its own and the lights turn automatically on each time you step in the toilet. 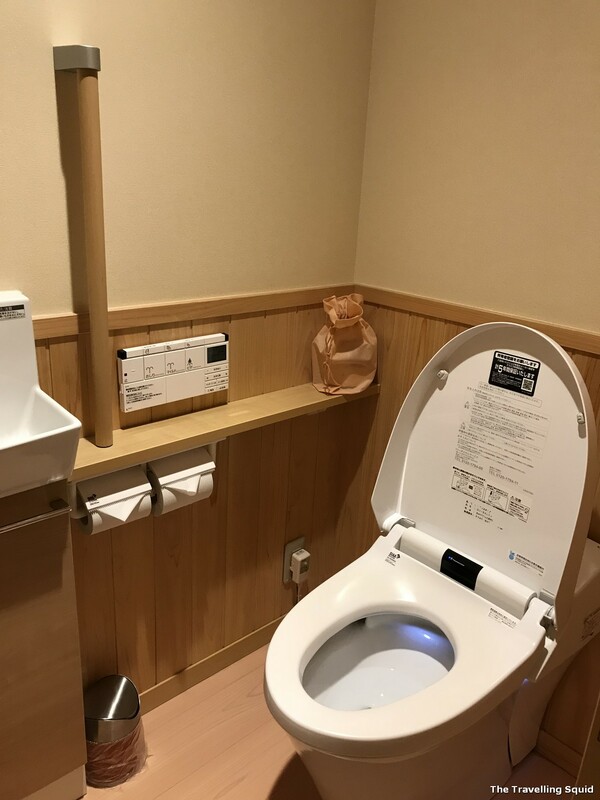 If you’re wondering what that little float is, it’s for children to use while using the toilet. 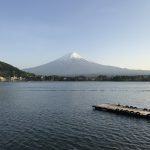 The staff made green tea when she first arrived to introduce the place to us. The service was really good. 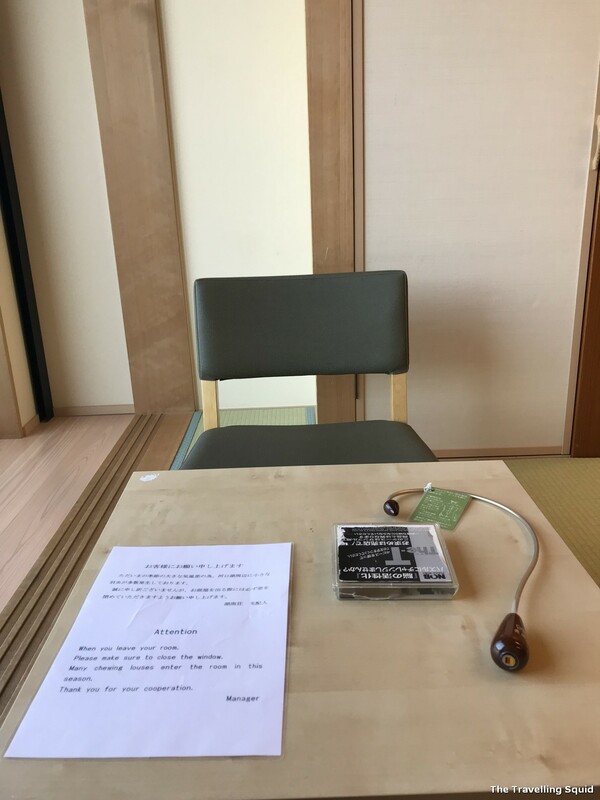 A middle-aged Japanese lady came in to explain to us the various functions of the room. 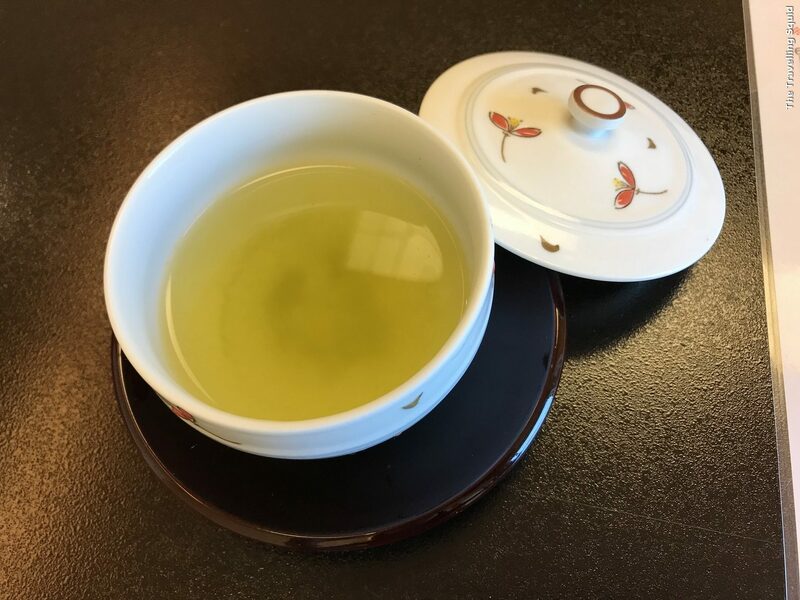 She first made green tea for us using a ‘kyusu’, a traditional Japanese teapot used mainly for brewing green tea. 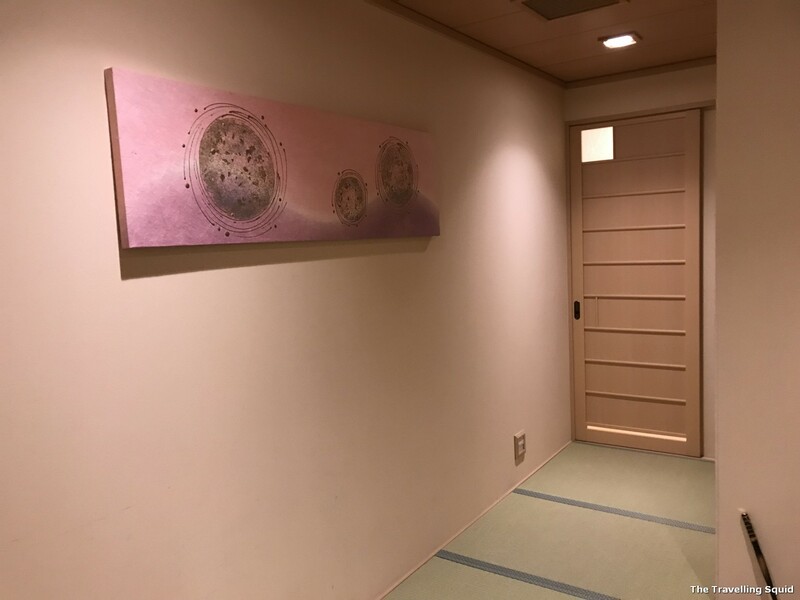 Then, she explained to us how to use the facilities that are available in the hotel, including the various onsens (a Japanese hot spring) available (more to be covered in a separate post). She also asked us about our meal preferences, for the ‘kaiseki’ dinner which would be served later in the room. 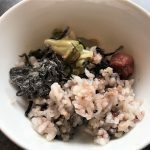 Should you be wondering – Kaiseki refers to a traditional multi-course Japanese meal involving a variety of techniques, such as steam, boil and grill. Hand-drawn of the direction of sunrise, and sunset. 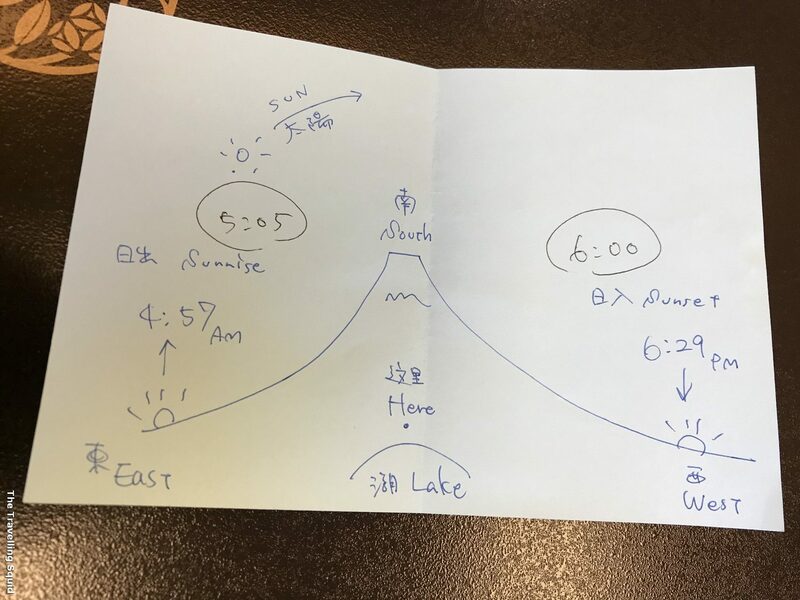 The lady also drew us a map with the sunset and sunrise timings, as well as the directions, which was easily understood even for me, a person with a bad sense of direction. Last but not least, she also provided us with the yukata (a light cotton kimono which is worn by both men and women.) That came in really handy when we were about to have our kaiseki dinner and go to the onsen. 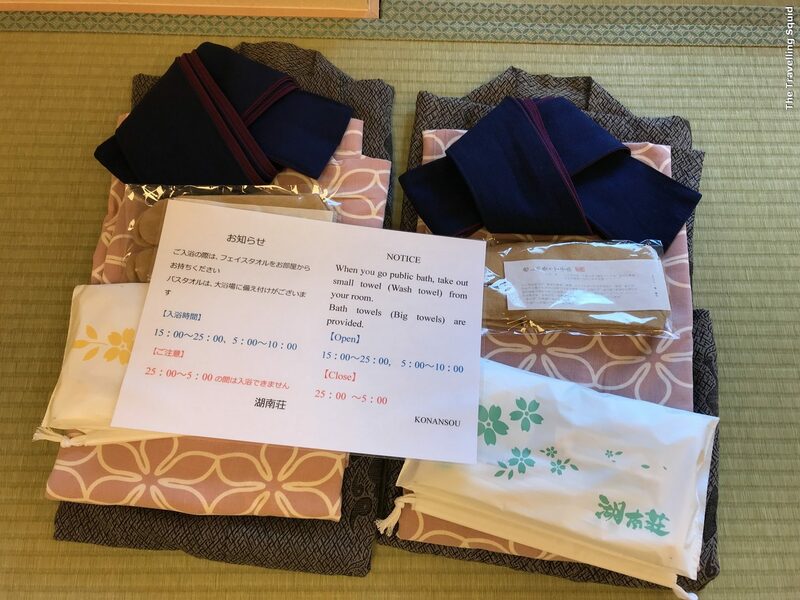 There was also a toiletry bag which came with socks, a toothbrush and a wash cloth for the onsen. 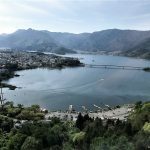 The hotel provided us a Yukata to try – a traditional Japanese dress. 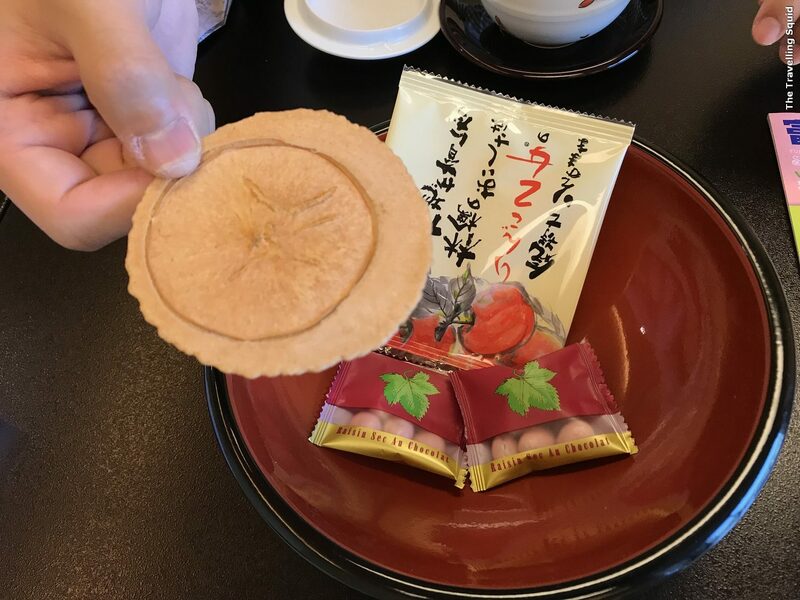 A welcome snack – an apple cracker. The apple flavour was really strong. There were also some welcome snacks prepared for us – I polished them off. 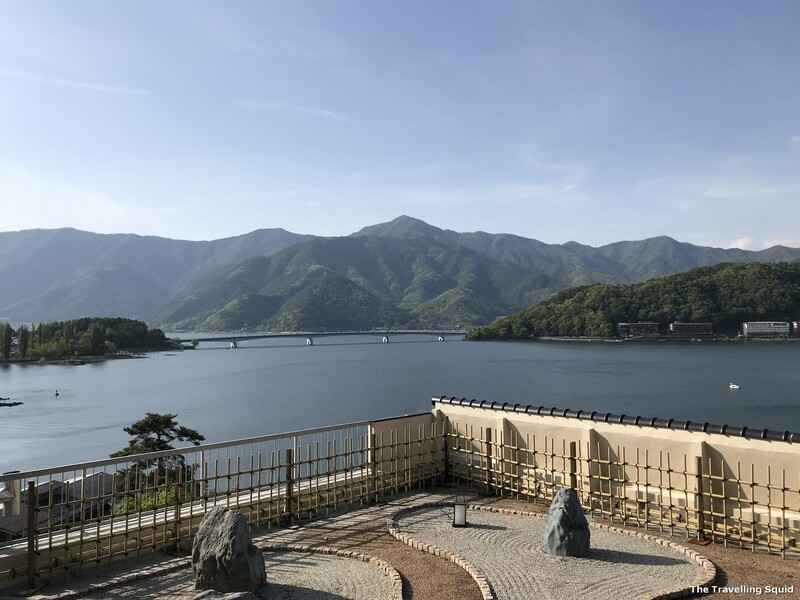 I have prepared three more posts on Hotel Konanso in Kawaguchiko largely because it’s a new experience worth relating. 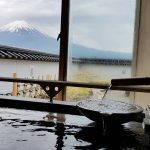 Having a dip in the onsen was my first, and it was a memorable experience. (Made me feel quite sleepy afterwards). 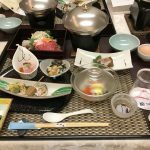 The kaiseki dinner was perhaps the most interesting aspect during our stay at Hotel Konanso. The stay cost us SGD473/ USD355 with dinner inclusive. The difference between the options with and without dinner is SGD50/ USD38. In other words, the meal was extremely value for money – I’d encourage you to opt for it when booking the room. 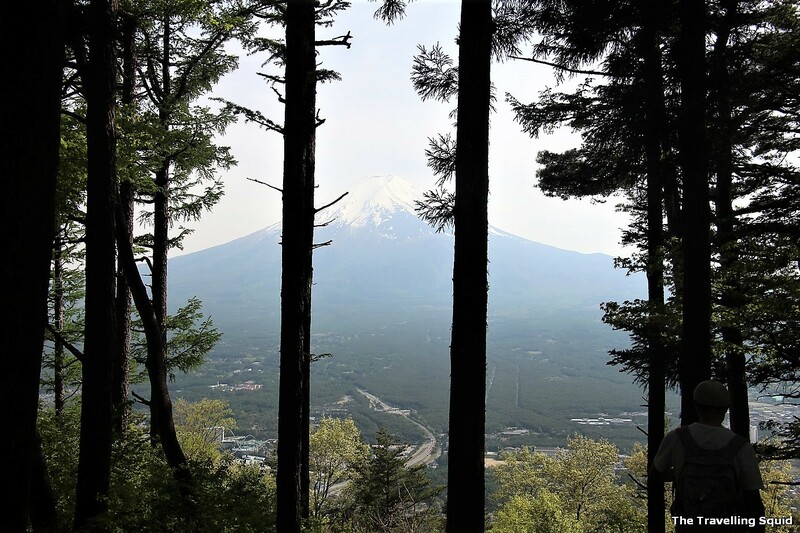 We also paid an extra 3,400 yen (SGD40/ USD30) for a 50 minute private onsen in the morning, over-looking Mount Fuji. 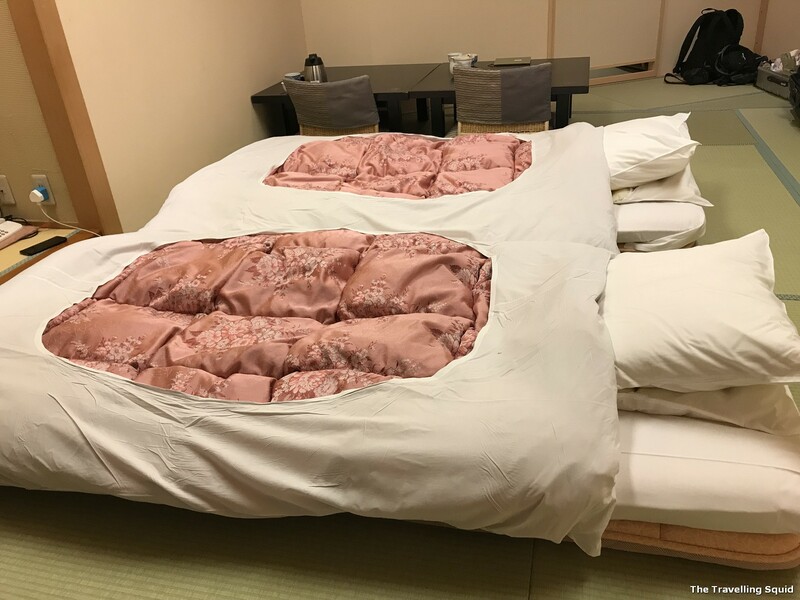 I would say that while living in a ryokan may not be as comfortable as a Western five-star hotel with a high bed, a higher chair and luxurious marble bathrooms, it was an experience. 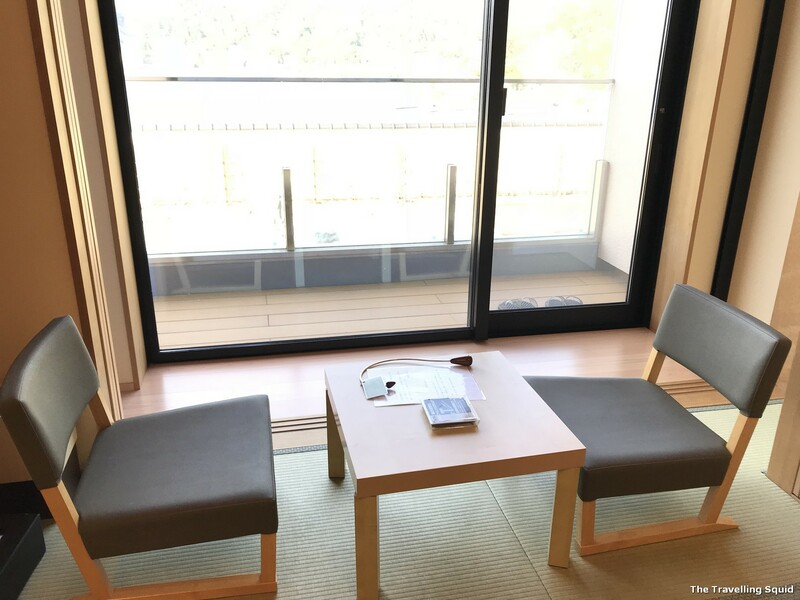 A ryokan is not a room I would like to live in for many days, but that one night’s stay was memorable, and taught me a lot about Japanese culture. 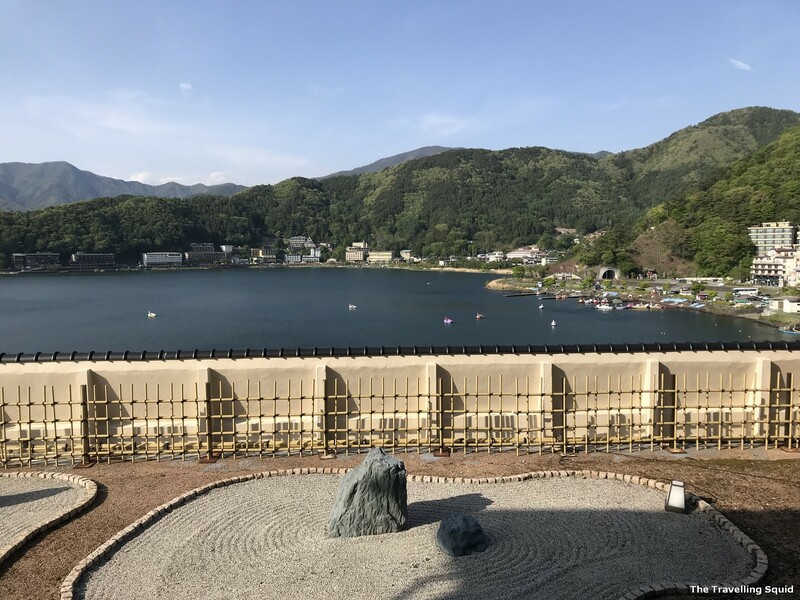 7 Responses to "Review: Our Ryokan in Hotel Konanso in Kawaguchiko with a Lake View"